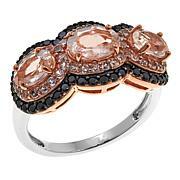 If you love the negative space look, this ring is for you. 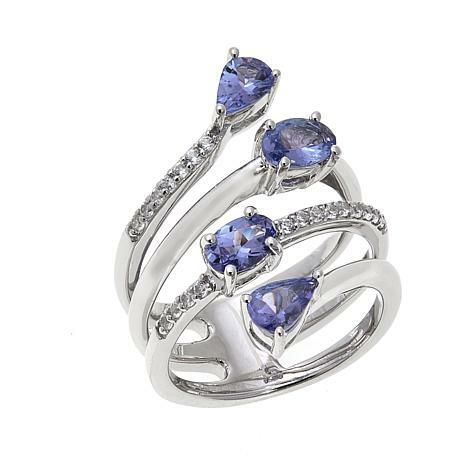 The rich tanzanite against the white zircons makes for an unforgettable ring. 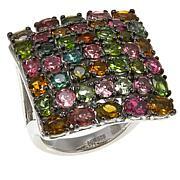 The gemstones, the colors and the design say it all! You just never know w/tanzanite unless you're willing to pay top dollar. 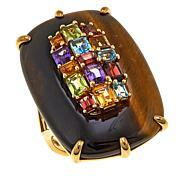 This ring is reasonably priced and the color and clarity is really good. Honestly, I wasn't expecting much due to the low price but I'm happy to say that I was pleasantly surprised. A good fit, good value and a keeper. Tanzanite is my favorite gemstone and I really love this ring. Just wish I could have bought a larger size because I think it would look better on a larger finger than my ring finger. Also like the different shapes of the stones. Well made. I found the color of my stones to be adequate. Mine are not the rich dark color as promised but they are not washed out either. The color of mine is somewhere in between but has enough color in it to appreciate the stones. It fits true to size and looks like a very expensive ring. I received this as a wedding anniversary gift. This is so beautiful & different. It looks like it would cost $300 or more. The tanzanite is very saturated blue-purple color & the white zircon looks like diamonds. Love it!!! The saturation of color of the tanzanite on this ring is rich. The ring is true to size (for me, a size 7 for my middle finger), has style, beautiful in color, and has a confortable good weight to it. Amazing value too!